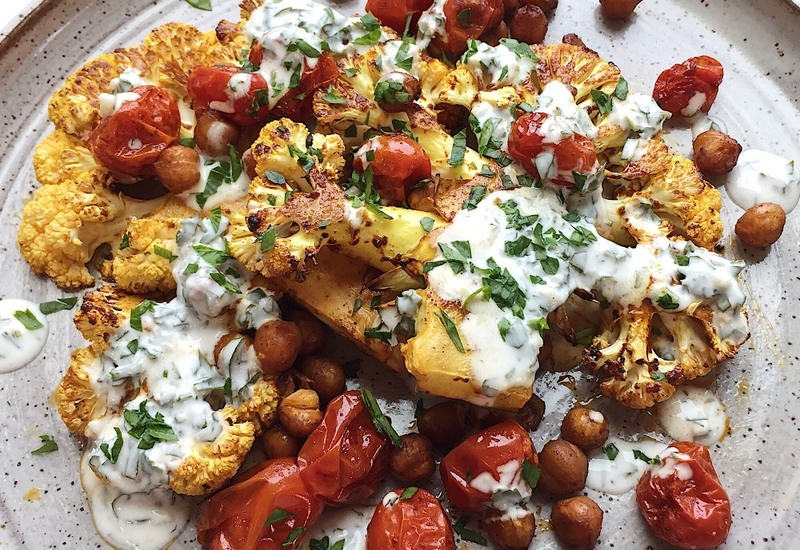 This roasted cauliflower steak recipe will blow you away not only with beauty but also with taste. The smoky marinade is made with smoked paprika, turmeric and cayenne. It is the perfect pairing to the tangy yogurt sauce made with fresh parsley, garlic, and lemon juice. If you are ever wondering what to serve as a vegetarian main dish, this is the perfect recipe! It is also gluten-free and ready to enjoy in about 30 minutes flat. To cut cauliflower steaks, remove the outer leaves and trim off the bottom to make a flat surface. Place this flat surface down on your cutting board, and and slice 1-inch wide pieces from top to bottom, creating wide and flat "steaks." Per Serving: 506 calories; 33g fat; 43.5g carbohydrates; 16g protein; 8mg cholesterol; 1675mg sodium. Did not see it for this dish at all, but I was so wrong. My friend and I absolutely loved it! So many layers of flavor going on and I upped the amount of cayenne just slighty which was a nice bit of heat in each bite. Overall, this recipe tasted good, though it's more of a roasted cauliflower recipe than a 'steak' recipe. It certainly doesn't replace steak, but it's a solid 'roasted cauliflower'. I liked the chickpeas that roasted along with the cauliflower best. The sauce and sides were great but the cauliflower was only okay - I'd opt for a more standard roasted cauliflower that's already chopped up, easier to eat and portion out. Loved everything about this dish. At first glance, the recipe looks weird because everything is red 🤣 Red tomatoes, red chickpeas, red cauliflower ... red red red. But do not be fooled by the outward appearance. The flavor is what matters here. Make extra chickpeas covered in sauce. And extra white sauce. You'll be glad you did. My husband raved about the flavors in this dish and loved the yogurt topping! The juicy flavor of the tomatoes with the slight crunch of the chick peas was perfection.